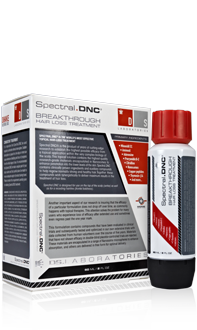 • The result of many years’ research, Spectral DNC® offers a new solution for those losing their hair. It contains a blend of active principles with clinically-proven efficacy at preventing hair loss. In addition to its preventive role, this new product has been specifically formulated to treat male androgenetic alopecia, more commonly known as male pattern baldness. Spectral DNC® has produced positive results in people who have previously had little success with other hair loss treatments. • The efficacy of Spectral DNC® comes from its unique formulation of active principles which include minoxidil, a molecule recognised for its positive effect on hair growth. It also differs from other treatments on the market in that it contains aminexil, a proprietary new molecule that counters premature ageing and hardening of the hair follicle, which is responsible for baldness. • As with any hair loss treatment, Spectral DNC® is particularly effective when used at the early stages of baldness. However, this product has also shown excellent results with more advanced alopecia including male androgenetic alopecia (male pattern baldness). This can develop as early as post-puberty and is caused by a process involving androgen hormones. These are converted into dihydrotestosterone, a molecule which causes the miniaturisation and destruction of the hair follicle and which ultimately leads to hair loss. It is exactly this process which Spectral DNC® counteracts, by deeply nourishing the hair root and stimulating its growth. • The formulation of Spectral DNC® is the result of considerable research including clinical studies, which ensure the quality and efficacy of the aminexil and minoxidil. The latter is included at a dose of 5% - recognised as the optimal concentration and validated by the American Food and Drug Administration (FDA). The addition of retinol boosts the effects of minoxidil, improving its absorption and efficacy. Other molecules have also been included such as proanthocyanidins which promote hair growth and adenosine which accelerates it. • When applied to the skin, Spectral DNC® is able to target its action in capillary cells by means of its nanosome formulation which makes it easier for the active principles to reach the hair follicles. Nanosomes are able to penetrate the skin’s pores and release the combination of active principles into the capillary cells. If you would like to benefit from these molecules, Spectral DNC® is now available to buy from the Supersmart catalogue. While individual response to this product may vary, results are normally visible after two to three months. If you have any doubts or experience any side-effects, you are advised to seek advice from a health professional. adults. Apply 10 sprays a day directly to areas of hair loss/thinning. Rub the liquid evenly over the area and leave to work. Do not rinse. Wash hands with soap and water immediately after use. Use daily for optimal results.